Regular readers know that this site tries to track concert offerings hosted by The Lab. I do my best to provide advance information, and I try to get over there whenever my schedule allows. Thus, those who may think that things are a bit too quiet over at the Center for New Music may wish to check out at least one of the three performances that The Lab is hosting this month. For those unfamiliar with the venue, the performing space is located in the Mission at 2948 16th Street. This is a short walk from the corner of Mission Street. This is particularly good for those using public transportation, since that corner provides bus stops for both north-south and east-west travel as well as a BART station. 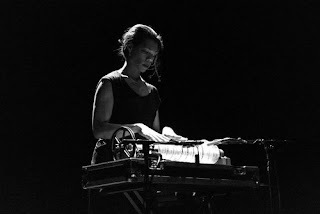 She will play as part of a trio, whose other members are John McCowen on clarinet and Håvard Skaset on electric guitar. The other set will be taken by Brooklyn-based cellist and composer Leila Bordreuil. Her set will consist of improvisations on a solo amplified cello. Amplification is provided by a variety of different types of guitar amplifiers, and the signals will be routed to a corresponding variety of different types of speakers. Bordreuil is particularly interested in investigating a wide diversity of timbres and creating unique sound distortion possibilities that transform the cello into a polyphonic instrument. Admission will be $25 with a $15 rate for members of The Lab. Doors will open at 8 p.m. Members may wish to login, and for others there is a Web page for advance registration. Sunday, July 23, 8:30 p.m.: This will be a concert by the 75 Dollar Bill duo, which was formed in 2012 by percussionist Rick Brown and guitarist Che Chen. Chen works with modal thematic material, while Brown provides earthy, elemental rhythms on a deeply resonant plywood crate. Their influences include early electric blues, the modal traditions of West Africa, India, and the Middle East, Sun Ra’s space chords, and a variety of approaches to minimalism from the last century. Admission will be $10, and members of The Lab will be admitted for free. Doors will open at 8 p.m. Members may wish to login, and for others there is a Web page for advance registration. Saturday, July 29, 9 p.m.: Laraaji was discovered busking with his zither in Washington Square Park by Brian Eno in 1979. Eno subsequently devoted the third release in his Ambient series, entitled Day of Radiance, entirely to Laraaji’s performances of his own music. Laraaji will bring his approach to “celestial sound making” to the Lab in a performance that will also include sound healing musician Arji OceAnanda. The title of their joint program will be In the Zone. Admission will be $25 with a $15 rate for members of The Lab. Doors will open at 8:30 p.m. Members may wish to login, and for others there is a Web page for advance registration.